I’m continuing on my journey to write about every quarterly edition of Field Notes that I have, with a few exceptions. Last time I wrote about Just Below Zero, and for this post, I’m choosing an even older edition, Mackinaw Autumn. As usual, this post will be image- and trivia-heavy, with a summary of specs at the end. Just one post left after this: Night Sky! 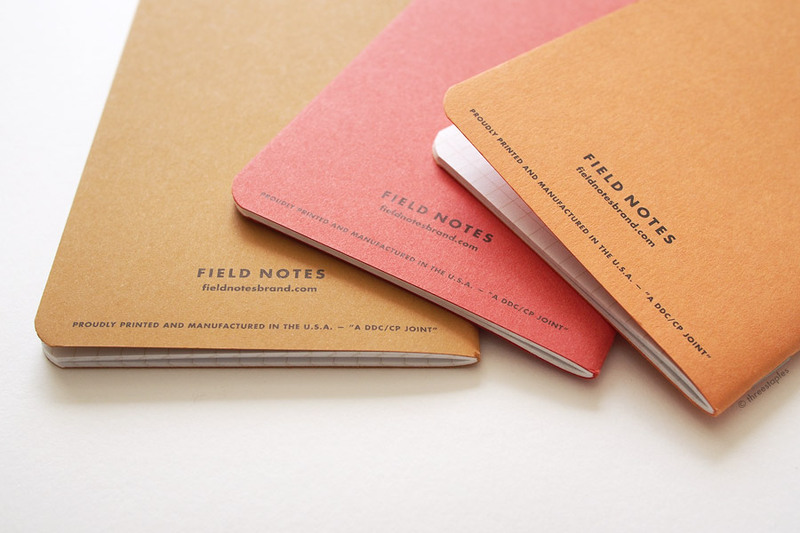 Mackinaw Autumn is the fall release of Field Notes from 2009, 4th in their quarterly edition series. It sits right in between Grass Stain Green and Just Below Zero, so you know how old it is. It’s another favorite of mine, for similar reasons that I like Just Below Zero: simple design and a seasonal theme. Field Notes only made 2,500 packs of Mackinaw Autumn. And when it was announced to the mailing list in September 2009, 500 packs they set aside for their website sold out in less than 24 hours, setting a new record at the time. It’s not difficult to see why it was so well-received. It really is, as FN describes it, “like a shrink-wrapped and pressed collection of fall leaves”, with 3 different delicious hues and a name that recalls the fall foliage in northern Michigan. After 34 of these quarterly editions, it’s hard to wrap my head around this but Mackinaw Autumn was the first fall edition. There have been other notable fall editions people often talk about, like Raven’s Wing (2010) and Drink Local (2013), but I think Mackinaw Autumn is the most fall-like one out of them all. I mean, the suggestion is in the name itself, but even without it the three cover colors – red, orange, and brown – evoke the autumn vibe well on their own, especially with the brown ink for the text. Which leads to the other major “first” in Mackinaw Autumn: it was the first multi-color edition in COLORS. The first three editions (Butcher Orange, Butcher Blue, and Grass Stain Green) were all 3-packs of identical books, but Mackinaw Autumn next got 3 different cover colors in its pack. Perhaps not a flashy “first” by today’s standards but it was a major one, as it paved the way for many, many future multi-color editions (see a list of them somewhere in here). In fact, according to the first COLORS recap video, the crew at Field Notes liked how Mackinaw Autumn turned out so much that they went with the same approach for the following season’s release, Just Below Zero. 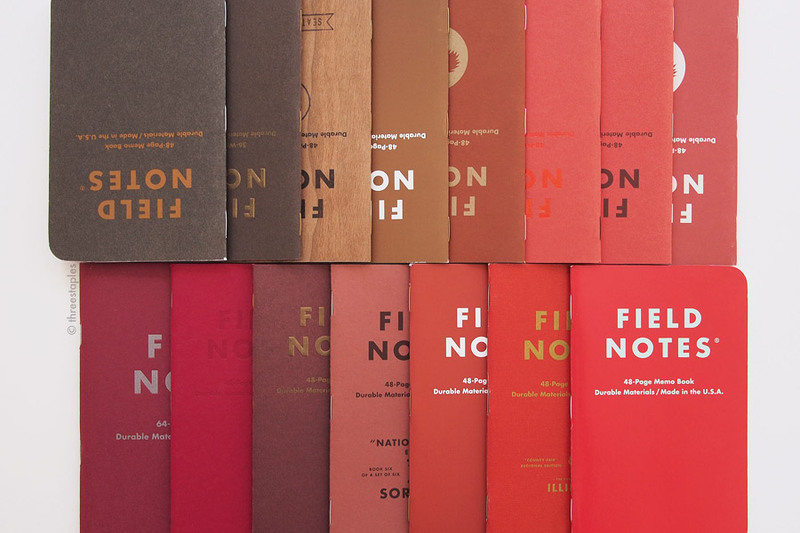 Just as with the first three limited editions, Field Notes went with their favorite, Michigan-based French Paper cover stocks for Mackinaw Autumn. Pop-Tone “Tangy Orange” for the red one, Construction “Safety Orange” for light brown, and Pop-Tone “Orange Fizz” for orange. 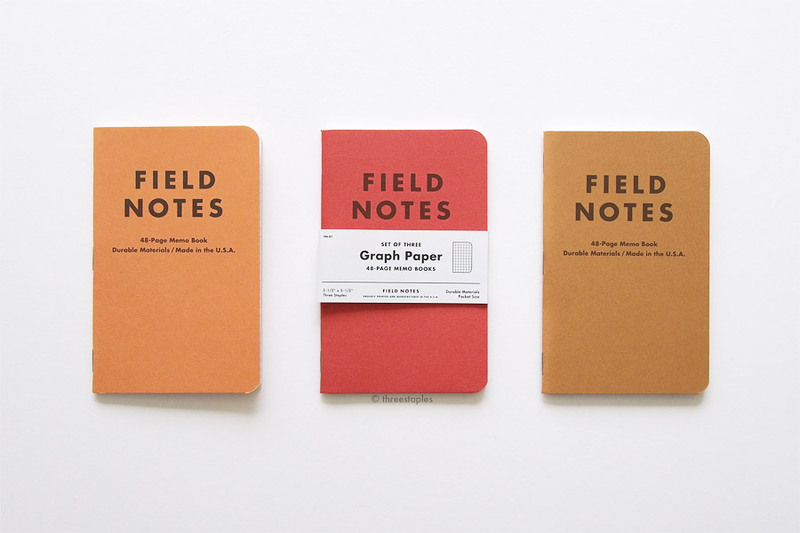 Or as Field Notes calls them “Burnt Red”, “Running-Board Brown”, and “Harvest Moon Orange”, respectively. (They never specified which is which but this is my best guess). According to the aforementioned video, Aaron Draplin, whose family is from northern Michigan, selected these colors for Mackinaw Autumn, and I think they make a very harmonious set. This might shock some fellow FN fans but I’ve never been a big fan of color orange in general. I think it’s just okay but I quite enjoy it in Mackinaw Autumn, especially the “Burnt Red” one, which I’d describe it as red-orange. There’s something about that rich but muted color that lets the wonderful fibrous texture of the matte French Paper shine through and remind me of dried, fallen leaves. The rest of the features in Mackinaw Autumn are pretty “classic” as I’d like to say, that we see in several of the following COLORS editions (see my Just Below Zero post for elaboration on this). 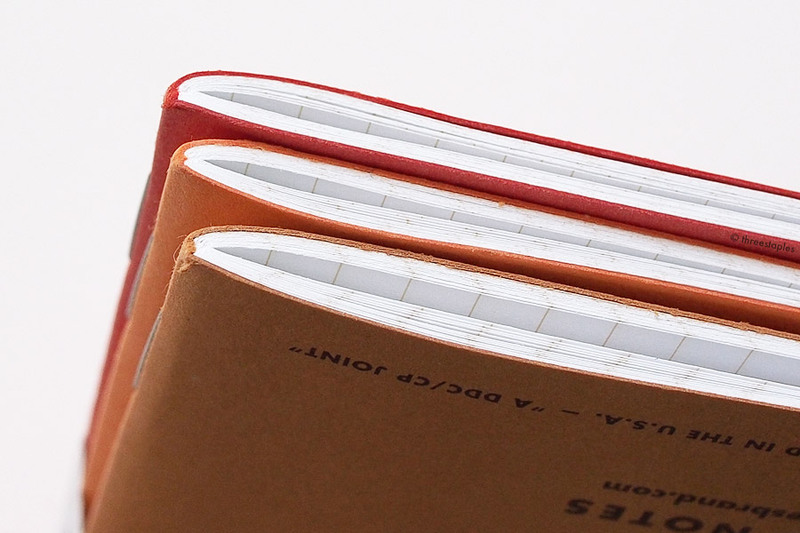 The body paper inside is the then-standard Boise Offset Smooth paper, and for the graph grid, they used the same light brown color “Double Knee Duck Canvas” that’s in the standard kraft memo books. It might seem like an underwhelming color choice for a limited edition but it’d be hard to argue that it doesn’t go well with all the warm colors on the covers. Light brown graph grid and matte cover. Check out the texture and folds on it. Simple white belly band with item number FN-01 and “Graph Paper” as the title. Covers are colored all the way through the paper. Overall, Mackinaw Autumn is a very straightforward edition without many bells or whistles, but that’s why I like it (see how it fares in my FN ranking here). 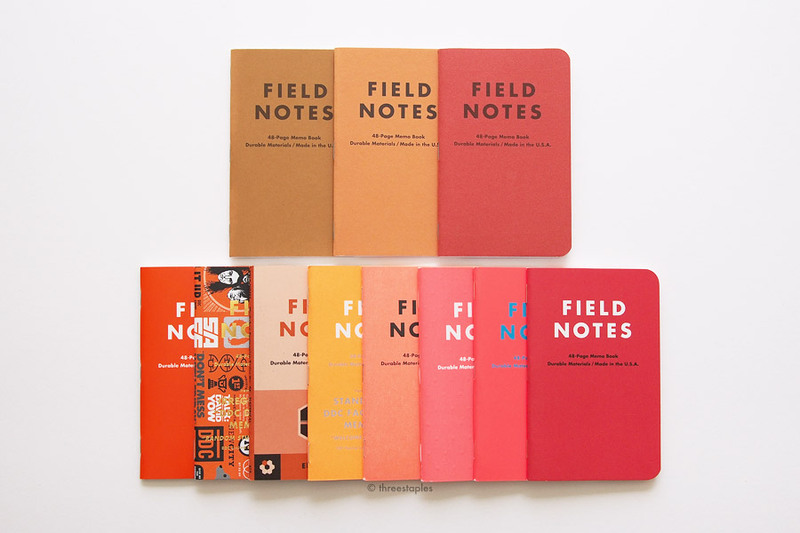 It has all the simplicity and practicality of the original Field Notes but with the warm, rich shades that I enjoy so much in the fall season. In Mackinaw Autumn, like many other “classic” editions, colors get undivided attention, and I’d love to see Field Notes interpret the fall season with another set of colors. Same paper (from left): Inside cover of Shenandoah’s “Chestnut Oak”, National Crop’s “Wheat”, Mackinaw Autumn (brown), Mackinaw Autumn (orange), Mackinaw Autumn (red), and Sweet Tooth. 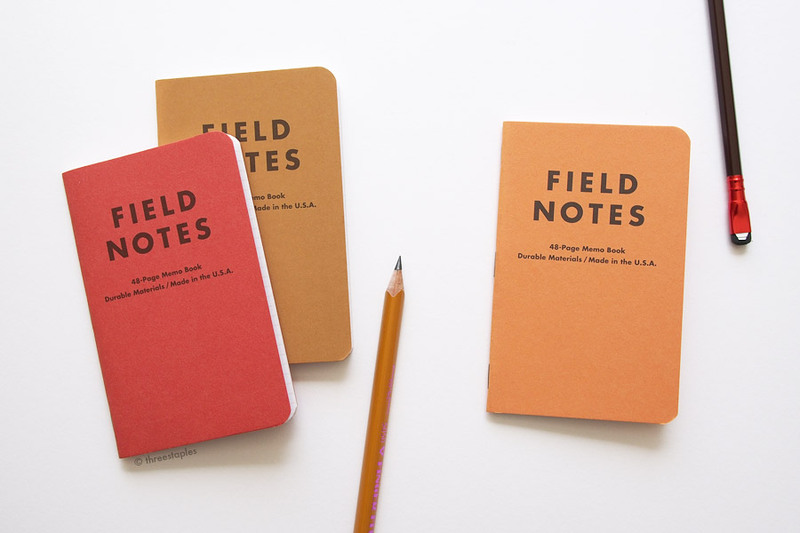 A quick “first” in the COLORS subscription: Field Notes started adding two standard kraft 3-packs (one Graph and one Ruled) as bonus items to the yearly subscription starting with Mackinaw Autumn. And a few more notes on the cover colors of Mackinaw Autumn. 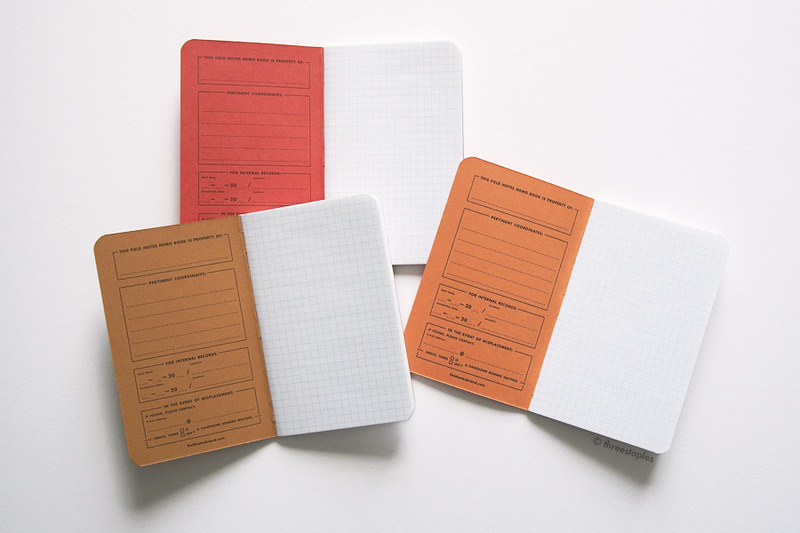 French Paper’s Construction in “Safety Orange” (the light brown one) is also used in National Crop (Spring 2012) much later in the quarterly edition series, in its “Wheat” book. It reappears in the fall of 2015, too, in Shenandoah’s “Chestnut Oak” book as the inner half of its duplex cover (see the photo above). I love how unrecognizable the paper color gets in different contexts, especially if the logotype is printed in a different color, as in the case of Sweet Tooth (Spring 2016) and Mackinaw Autumn’s “red” book. They both use French Paper’s Pop-Tone “Tangy Orange” but Sweet Tooth is printed with red metallic foil, while “Burnt Red” is printed with brown ink. I don’t know how other FN fans feel about it but I personally welcome seeing these old colors reinterpreted in newer editions. Top row (from left): Nixon (2015), Ambition, Cherry Graph, Drink Local “Bock”, Tournament of Books (2016), Sweet Tooth, Mackinaw Autumn, and Tournament of Books (2015). Bottom row (from left): Arts & Sciences, Red Blooded, Ambition, National Crop “Sorghum”, Drink Local “Amber Ale”, County Fair, and Starbucks Reserve Coffee Origins “Africa”. From left: Mackinaw Autumn, Butcher Orange, Drink Local “India Pale Ale”, National Crop “Wheat”, Mackinaw Autumn, Original kraft, and Shenandoah “Red Maple”. Mackinaw Autumn (top row) compared to similar but much “bolder” colors and non-solid colors on the bottom row. From left: Expedition, DDC Irregular Issue, Workshop Companion “Electrical”, DDC Pop-Up Shop, Neon Ice Pop, Starbucks Capitol Hill, Unexposed, and TEDx. Some of these are neon, even though they don’t look like it in this picture. Mackinaw Autumn is the 2009 Fall edition of COLORS, the 4th in the series. 500 3-packs were available through the FN website. Subscriptions back then were $129, and FN started adding the bonus of 2 3-packs of kraft memo books with Mackinaw Autumn. Planning for canning and making jams. A very old FN color comparison post (with Mackinaw Autumn) that makes me feel a whole lot better. I’m not alone, and I certainly wasn’t the first. Another blast from the past but check out Patrick Ng’s beautiful photos of Mackinaw Autumn paired with leaf-shaped sticky notes. Mackinaw Autumn was featured at this blog made for the Where The Wild Things Are movie. A review from a fountain pen user’s perspective. An “unboxing” photoset of Mackinaw Autumn subscription package. What are your thoughts on Mackinaw Autumn? 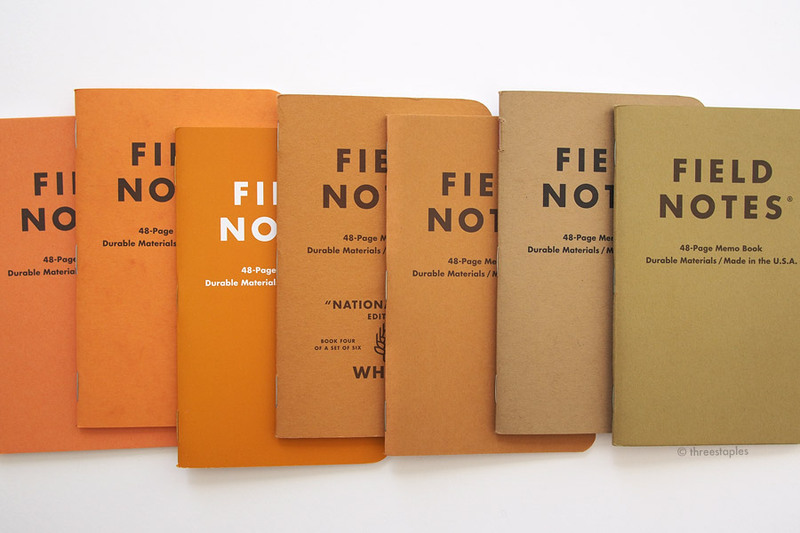 And what’s your favorite fall edition from Field Notes so far?